Larger Project 1-13, Master Bathroom » Roger Perron Inc. 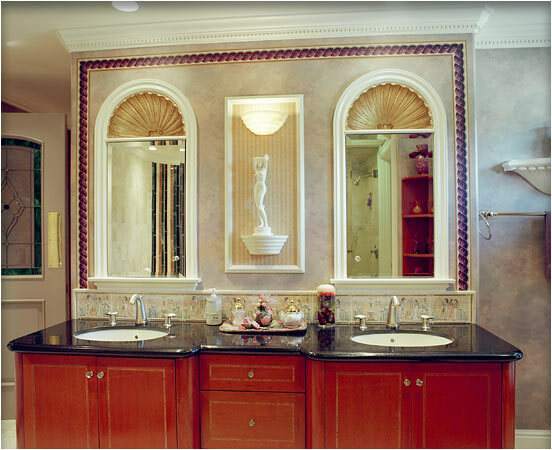 This elegant Italian renaissance style master bathroom has custom-built cherry wood cabinets. The double sinks are surrounded by a black granite counter. A white figurine statute adorns the wall above the sinks, in between double mirrors. The bathroom door has a colorful stained glass design. Architectural design for this major home remodel and luxury floor plan in San Marino was created by Roger Perron, design-build contractor, with contributing architects Curt Sturgill and Bob Cooper.